For meeting the diverse choices of the client, we are engaged in trading, exporting and supplying supreme quality Mens Winter Wear that is worn by the men in the winter season. Fabricated with perfection at vendors' end, this range is as per the latest fashion trends of the market. Moreover, we offer these men wears in different attractive designs, sizes and appealing colors and can be customized as per the requirements of our clients. We are the manufacturer and exporter of Woolen Sweater. 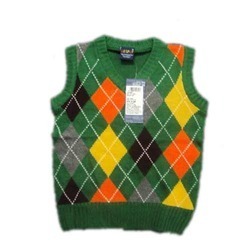 We are involved in providing a huge variety of Woolen Sweater. Excellent quality raw materials like fabrics are applied in producing these sweater. Our products are extremely durable as well as easy to maintain. These products are available in various sizes and designs to meet the specific need of our customers. The sweaters provided by us will not only make you look fashionable but keep you warm. We are the manufacturer and exporter of Winter Jacket. We are engaged in offering our clients Winter Jacket. We design these jackets in attractive colors with cartoon prints so as to attract the attention of the children. These jackets are ideal to be worn in winter and very warm. These Jackets are designed in conformity with latest trends and using superior quality & skin-friendly fabric.